Desirata Hollow is a fairy godmother and pretty good at it, too. However, she’s never been good at planning ahead and even though she knows the moment she dies, she isn’t well prepared for it. She leaves her wand and vague instructions to Magrat Garlick in the hopes that the young witch will make a good fairy godmother to at least one young princess, Ella. Desirata also leaves strict instructions for Nanny Ogg and Granny Weatherwax not to interfere, hoping that when they find out, they will help Magrat. Of course, the three witches are soon riding their broomsticks to the distant Genua with the intension of preventing Ella from marrying the prince. On the way, they realize that someone is making fairy tales to come literally true which isn’t a good thing at all. And more horrifyingly, they encounter foreign foods and customs which infuriate Granny especially. Also, Magrat is able to use the wand to change anything into pumpkins. Witches abroad focuses on the nature of stories and how they affect people and vice versa. Granny also encounters someone from her past. They also muse about happy endings and how they can’t be forced on people from outside. The story is woven around the Cinderella story but if not inverted, at least turned sideways. Lots of other fairy tales make an appearance, too. About half of the book is the witches’ journey to Genua and it had some of the funniest scenes in any Discworld book I’ve yet read; Granny taking revenge on some card sharks and Greebo, Nanny’s cat, eating a vampire while the witches are oblivious to the whole thing. Witches are my favorite Discworld characters and they’re in fine form in this book. “And the people from the city – not the ones who lived in the big white mansions and went to balls in fine coaches, but the other ones. They were the ones that stories are never about. Stories are not, on the whole, interested in swineherds who remain swineherds and poor and humble shoemakers whose destiny is to die slightly poorer and much humbler. The comic has a continuous storyline, so spoilers for the previous collections. Cutter, the chief of Wolfriders, have been reunited with his family but most of his small tribe has been captured. 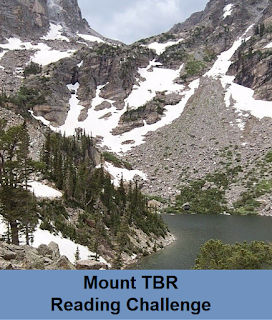 They’re held inside the Blue Mountain where another tribe of strange, tall elves lives. All their lives the Wolfriders have fought against humans but now to their amazement they notice that the humans near Blue Mountain worship the elves inside. Cutter is determined to free his tribe, of course. The new elves call themselves Gliders and they have gigantic bond birds. Strongbow shot one of them for food and that’s why they enslaved the tribe. The Wolfriders are given a way to make amends but can they trust the new elves? Because among them is Winnowill, the evil elf that Savah warned Cutter about. She and the other Gliders call themselves the High Ones, the ancestors of all elves but can that be true? In this story we get to know more about the Wolfriders’ origins and about the mysterious High Ones. These stories are darker than the previous ones. Characters are tortured and face the consequences of that. There’s more violence than in the previous collection. We also see the dark side of recognition. In the first collection Cutter recognized Leetah and she resisted him because he was a stranger and in her eyes a savage who brought to Leetah and her village permanent change which she didn’t want. But in time, she was able to overcome her objections and fell in love with him. But here we see the power of recognition as the purely biological drive that it is; a method to select a male and a female whose offspring would be the most talented and powerful among elves. That drive doesn’t care if the two are in any way compatible with each other or already in relationship with someone else, and it brings a lot of anguish in this case when one young Wolfrider recognizes a Glider. No romance is possible between them, just a biological need. The collection also ends in a cliffhanger. Elfquest is one of my favorite fantasy series and it’s a pleasure to reread it. It’s just as visceral and wonderful as I remembered. The complete collection also includes art from the original issues and the bridge pages from Marvel reprints which are all done by Wendy Pini. Seven turns of seasons have gone by since the Wolfrider tribe’s holt was burned down. The elves and their wolf companions have found a new home at the Sorrow’s End with another elf tribe, the Sun folk. They are a peaceful people who had only one hunter among them until the Wolfriders came there. The leader of the small Wolfrider tribe, Cutter, has even found a family. But then the peace is shattered: humans have come! The human group is small, but they still hate the elves. Cutter lets the three half-starved humans leave unharmed but he realizes that the Sorrow’s End isn’t safe anymore. There are more humans in the world that he realized before and it’s likely that the elves must defend themselves against the humans at some point. Cutter also starts to wonder if there are more elven tribes in the world. In the end, he decides to leave and look for any other elves. He tries to leave alone but his best friend Skywise and their wolves Nightrunner and Starjumper come with him. First, they return to the troll caves which are deserted. They morn over their burned holt but they’re attacked and captured by two trolls who are after Cutter’s sword. They claim that the sword holds the key to finding a treasure. Apparently, another troll tribe attacked and killed the other trolls. Cutter is more convinced than ever that there are more elf tribes in the world. Meanwhile, back in the Sorrow’s End some strange and terrible power has taken over the tribe’s best magic user, Savah. That power threatens Cutter and Skywise, as well. So Cutter’s lifemate Leetah has to decide if she will follow Cutter and try to find him. She has lived her whole life in the peaceful village so the decision is hard, even when the Wolfriders will come with her. Most of this collection focuses on Cutter and Skywise. While Skywise is often seen as the dreamer of the tribe, this time it’s Cutter who dreams so big that others doubt him. Still, Skywise has absolute faith in him and follows his friend pretty much everywhere he leads. Most of the Wolfriders follow their chief because they love him, not because they think that he’s infallible. Cutter is also one of the youngest of his tribe and he seems to the chief because his father Bearclaw was the chief before him. But the Wolfriders aren’t meek followers; they can and will challenge their chief if they think he’s in the wrong. Not all humans we see in this story are a bad. The elf duo also has to examine their assumptions about humans; even though they’ve gotten their ideas from long and bitter experience, they have to confront the fact that not all humans are the same. Humans killed Skywise’s mother only hours after he was born, so he has very difficult time accepting that. 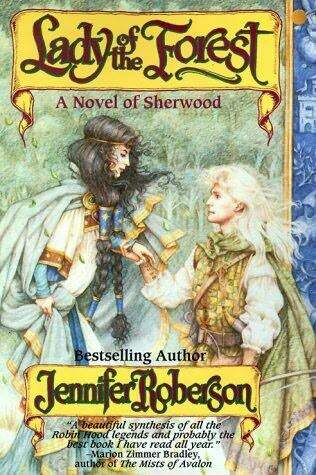 We also get hints about what other elves might be like and the collection ends with a cliffhanger. But other elves also get their moments in the sun. Leetah wrestles with her fears. She’s Cutter’s lifemate and the Sun Folk’s healer. She’s lived her whole life in the village and she’s secure and comfortable there. But when she’s confronted with the choice to leave and look for Cutter, it terrifies her which is, of course, understandable. Strongbow is the Wolfrider’s best archer who sends (uses telepathy) instead of speaking. He dislikes the Sun folk as soft and weak, and hates humans. He even challenges Cutter when the chief decides to spare the humans. Cutter and Leetah’s small cubs almost steal the show: Ember is already a tomboy and a Wolfrider through and through while her brother Suntop is a quieter boy whose magical powers are already budding. Ember’s wolfcub is adorable! The plot doesn’t move in such a quick speed as in the first collection, which is good because we now have the chance to explore the world and the characters better. What I really like in this story is that the time move forward and the people change with it. This is even clearer in the later stories where children grow up and humans form their communities. The Wolfriders are clearly not Tolkien elves: they’re smaller than humans and live with wolves, bonding with them. The wolves are animals and not supernaturally intelligent or anything else supernatural. The Wolfriders are very aware of the natural cycles of the year as well as life and death. They’re all hunters who eat their meat raw. At the same time, they love, respect, and cherish every member of their tribe. Not everyone is a warrior and thankfully not everyone has to be. The Sun folk as similarly small in stature but very gentle people. They are farmers who live in the same village pretty much their whole lives. Their dwellings are small and simple compared to the Middle-Earth elves. While the Wolfriders have had to live their lives quietly in the forest, the Sun folk haven’t had enemies to hide from. They are loud and party loudly, too. Excellent collection of stories but the next two are my favorites! 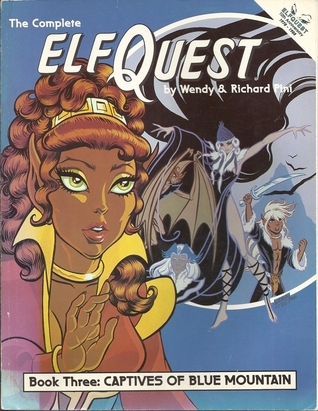 Elfquest is one of the first, if not the first, fantasy comic I ever read. Only this first collection was published in Finnish back then and I had to wait for many years until I found the next issues in English. Some years back a lot of the comic was published here in Finland in small, black and white issues. I still have the color printings but the soft covers are starting to fall apart. 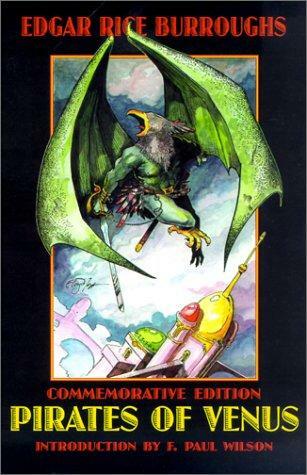 The Pinis have started to publish the Final Quest and I’m hoping that I’ll have enough money to get the collected editions as they come out. 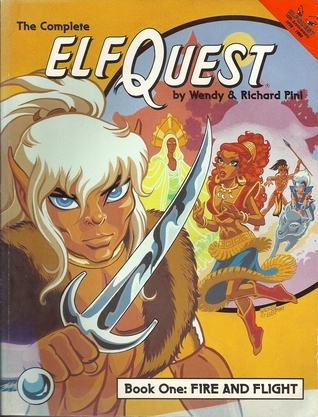 Also, an Elfquest adventure game was published this year. We’ve played it and it prompted a reread. This first collection introduces us to the world of Two Moons and the small Wolfrider tribe of elves. In just a couple of pages, the Pinis show us how the elves literally fell from the sky to this world but were immediately attacked by the fearful humans. That hostility continues through the whole series. Fire and Flight starts with the humans who have captured one of the Wolfriders. The elves’ young chief Cutter and his friends rescue the prisoner and in retaliation the humans burn the forest where they all live. The tribe flees the flames to the troll’s underground home. But they aren’t welcome there and have to find a new home. The trolls trick them into a passageway which ends to a desert and the elves have no choice but to try to cross it. They’ve lived in a forest their whole lives so a desert is an alien environment to their and their wolves. The Wolfrider tribe has only 17 members and all of them are individuals. 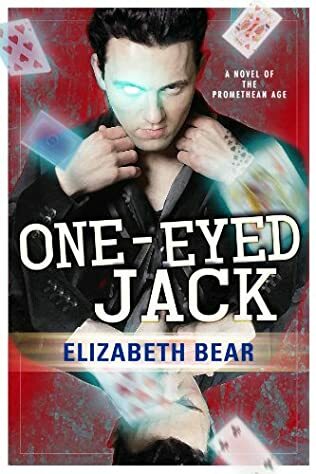 That isn’t yet so clear in the first collection which is focused on the chief Cutter and his best friend Skywise (and later Leetah). In fact, in these first issues the tribe seems at first to have very clear gender lines: men hunt and protect, and women stay in their holt. However, this changes later and rather dramatically, and even in this first collection Woodlock is a male who stays back at Father Tree with the women of the tribe. I love pretty much all of the characters and they change and grow and the series continue. The next collections also bring a lot of new characters to the tale. This is a great introduction to the story and the characters. 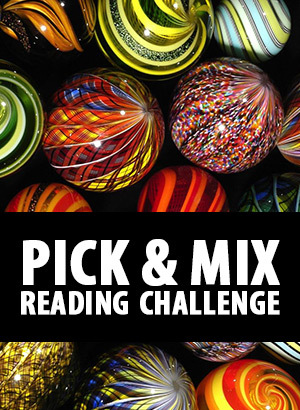 It moves quickly and it’s easy for this reader at least to immerse herself into the story. Pini’s art isn’t yet as sophisticated as it will be but it’s already very detailed and unique in style. Each elf is easy to distinguish even in crowd scenes. The style difference is very easy to see in the reprints with pages that Pini has added later. Sadly, I don’t have them (yet). While on the surface this is a quest fantasy, already the first issues deal with such themes as trust, racism, and loss. Also, the theme of choice versus instinct is clear in the latter half of the issues. 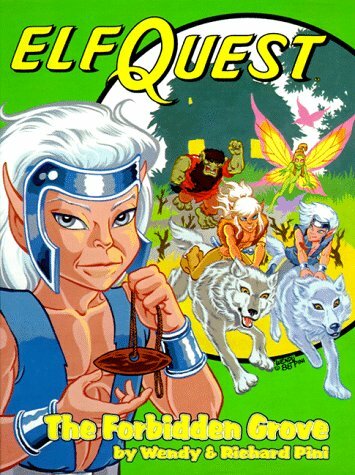 Elfquest is one of the best fantasy series I’ve ever read and it starts strongly.